Before: Front (left) central tooth has a poor restoration and does not look natural. It is also not contoured properly to match the gumline of the rest of the teeth. After: Replaced with an All Porcelain Crown (no metal). Tooth is now contoured to match the rest of the gumline. The restored tooth looks very natural and matches the shape and color of the patient's teeth. Before: Front four teeth have staining and do not look natural. Teeth also show a splaying outward and the bite is not closed. After: Replaced with an All Porcelain Crown (no metal). Crowned teeth also show proper closure of gap giving patient a natural smile. Before: Discolored front teeth that are oddly shaped and have small spacing defects. 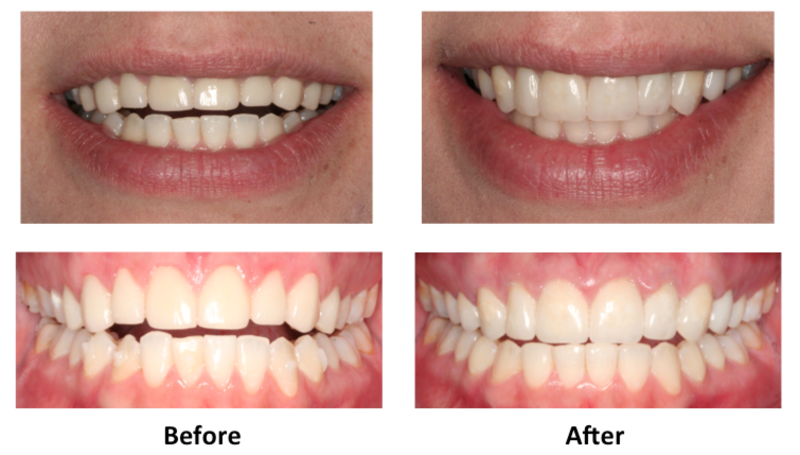 After: Veneers placed on the six front teeth that require minimal tooth preparation and provide an esthetically pleasing shape to the teeth as well as color and spacing. Before: Front teeth on upper and lower showed oddly shaped edges and the teeth are misaligned. After: Recontouring of edges of teeth together with bite adjustment provides tooth alignment with edges of the teeth showing a rounded and finished look. Before: Patient previously had crowns done on her upper teeth leaving a reverse smile with no lip support. The reverse smile line gives the patient the smile of a 50 year old even though she was 27 years old. Lower teeth are also not properly aligned. After: New crowns with proper form and function show a rejuvenation of the patient's smile to reflect her age. Photos on the right also shows gums that are healthy and lower teeth have been recoutoured and are properly aligned.